user warning: Table './c1kidreader/cache_filter' is marked as crashed and last (automatic?) repair failed query: UPDATE cache_filter SET data = '<p>«Порожек» — это рассказ о девочке Лиде, которая не умеет ходить, но в ее сердце много жизни и приключений. Книга будет впервые издана с иллюстрациями. &nbsp;Весь тираж (1 тыс. экз.) 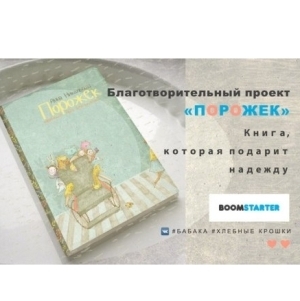 <a href=\"http://kidreader.ru/author/1813\">писательница</a> и художник передадут в библиотеки, больницы, дома-интернаты для детей-инвалидов из Алтайского края и Санкт-Петербурга, а также родителям «особых» детей.</p>\n<p>Проект стартовал 23 февраля. На сегодняшний день собрано свыше 75% от требуемой суммы в 250 тыс. рублей. Итоги акции будут подведены 25 марта. <a href=\"https://boomstarter.ru/projects/296149/porozhek_knizhka_s_kartinkami_dlya_detey_i_roditeley\">Принять участие</a> в сборе средств может каждый.</p>\n', created = 1556160978, expire = 1556247378, headers = '', serialized = 0 WHERE cid = '2:ae0de4aefd65f0c78621c6e719bc1b0d' in /var/www/clients/client1/web13/web/includes/cache.inc on line 108.
user warning: Table './c1kidreader/cache_filter' is marked as crashed and last (automatic?) repair failed query: UPDATE cache_filter SET data = '<p><a href=\"http://vk.com/kidreader\" target=\"_blank\" rel=\"nofollow\"><img src=\"/sites/all/themes/kidreader/icons/icon-vk.png\" width=\"32\" height=\"32\" /></a> <a href=\"http://www.facebook.com/kidreader/\" target=\"_blank\" rel=\"nofollow\"><img src=\"/sites/all/themes/kidreader/icons/icon-fb.png\" width=\"32\" height=\"32\" /></a> <a href=\"http://kidreader.livejournal.com/\" target=\"_blank\" rel=\"nofollow\"><img src=\"/sites/all/themes/kidreader/icons/icon-lj.png\" width=\"32\" height=\"32\" /></a> <a href=\"http://twitter.com/kidreaderru\" target=\"_blank\" rel=\"nofollow\"><img src=\"/sites/all/themes/kidreader/icons/icon-twitter.png\" width=\"32\" height=\"32\" /></a> <a href=\"http://feeds.feedburner.com/kidreader\" target=\"_blank\" rel=\"nofollow\"><img src=\"/sites/all/themes/kidreader/icons/icon-rss.png\" width=\"32\" height=\"32\" /></a></p>\n', created = 1556160978, expire = 1556247378, headers = '', serialized = 0 WHERE cid = '2:433da351ffd26b3fb95a9ac41951483c' in /var/www/clients/client1/web13/web/includes/cache.inc on line 108.